People of all ages and experience are encouraged to be onstage as actors, as well as offstage in production roles. Our shows include full-scale musicals, dramas, comedies, one-act plays (including original material) and occasional street theater. 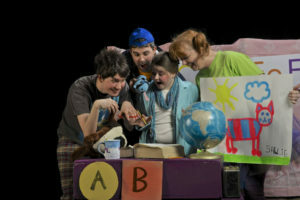 School-age children are given the opportunity to participate in plays geared specifically to child actors. We also support in-school productions in the local schools, giving technical guidance as well as material support. Because we believe in ongoing education in theater crafts, we present workshops open to the community. Past workshops have been offered in directing, producing, playwriting, singing, lighting, costuming, set design and makeup. We offer new workshops as the need arises and presenters become available. In order to delight, enlighten and educate local audiences, we periodically bring professional events to the valley in the form of music, dance and drama. We regularly sponsor a variety of entertainers at two of our popular events: Harvest Fair in September and Summernight in July. We provide scholarships, grants or honoraria to individuals in our community for the purpose of increasing theater skills, recognizing theatrical contributions, encouraging the creation of new theater experiences and supporting the theater arts in our community’s schools.